Despite the optimism professed by the White House, the plan to vote on repealing Obamacare on the controversial healthcare law’s seventh anniversary fell through due to objections from a number of Republican lawmakers. The vote on the American Health Care Act (AHCA), a budget reconciliation bill intended to start the repeal process, was scheduled for Thursday but postponed by the House Republican leadership after it became apparent it would not get enough support. To ensure the AHCA passes in the House and moves to the Senate requires 215 votes. There are 237 House Republicans, meaning that the party can afford 22 members crossing the aisle and joining the Democrats in opposing the bill. However, the current number of renegade Republicans is anywhere between 24 and 36, according to mainstream media outlets. One of President Donald Trump's key campaign promises was to “repeal and replace” Obamacare, the unofficial name for the 2010 Patient Protection and Affordable Care Act. Republicans in the House of Representatives came up with a three-phase plan to do just that, starting with the AHCA. Despite prior disagreements with Speaker of the House Paul Ryan (R-Wisconsin), Trump threw his full support behind the law, meeting with the dissenters from the Freedom Caucus on Thursday morning. The Freedom Caucus has been the most vocal Republican opposition to AHCA, arguing that the bill did not go far enough in repealing the mandates, taxes and entitlements established by Obamacare. On Thursday afternoon, the White House seemed optimistic about the vote. Members of the Freedom Caucus reportedly gave Trump a standing ovation, and several of them declared they stood with Trump on AHCA, according to White House spokesman Sean Spicer. That was not how the caucus members put it after the meeting, however, with Reps. Paul Gosar (R-Arizona) saying that “nothing new was agreed upon,” and Justin Amash (R-Michigan) going so far as to say the vote would fail if held tonight. “We're certainly trying to get to yes,” caucus chairman Mark Meadows (R-North Carolina) told reporters, but “I myself am a no at this moment.” The group has been demanding that some of the provisions scheduled for later phases of the repeal and replacement process be moved to the AHCA. One of the problems with doing that, however, is that Ryan structured the bill to comply with the “Byrd Rule,” a Senate regulation requiring reconciliation measures to deal only with matters with direct impact on the budget. 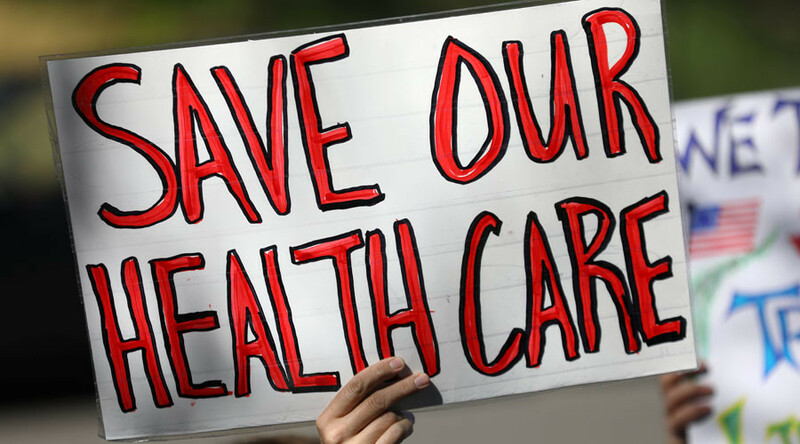 A report by the Congressional Budget Office estimated the original AHCA would cause 14 million Americans to lose healthcare coverage by 2018, with that number growing to 24 million by 2026. The CBO has yet to issue an updated report reflecting several Freedom Caucus amendments incorporated into the bill. Democrats have seized upon that estimate, calling the GOP proposal a “moral monstrosity” and a tax giveaway to the wealthiest Americans at the expense of the poor, women, children, and the disabled. Citing the CBO estimates, the Kaiser Family Foundation has argued that premiums and deductibles would actually increase under the AHCA by as much as $1,550. The billionaire Koch brothers also oppose the bill, announcing this week that their new 2018 midterm election fund will only serve those Republicans who vote against the AHCA, according to CNN. "Debate" on the bill, rather than a vote, will begin Friday morning, House Majority Leader Kevin McCarthy (R-California) told CNN after the postponement. Senate Majority Leader Mitch McConnell (R-Kentucky) reportedly told members of the upper chamber that the repeal-and-replace vote may not be held until Monday, Reuters reported. After the vote was postponed, the CBO issued its updated estimates for the AHCA, including the proposed "manager's amendment" introduced on Monday. It found that the changes would save less money than the previous version, and it would leave 24 million more people without health insurance in a decade.